Cisco Live Orlando has wrapped up, at least for me, and I can relax until Cisco Live Europe in January. I never realized how much work goes into Cisco Live until I became a TME. Building labs, working on slides, preparing demos, and arranging customer meetings is a months-long process and always a scramble at the end. It’s a great show, and I can say that having attended as a customer. It’s more fun and less work to be an attendee, but for technical marketing engineers, it’s still a blast and the highlight of the year. Orlando had a special significance for me because it was at CL Orlando in 2007 that I decided I really wanted to be a TME. I attended several breakouts and thought that I’d love to be up in front of the room, teaching folks how about technology. The only problem: I was terrified of public speaking. It took years of trainings, including many as a Toastmaster, before I became comfortable in front of an audience. That’s a story for another time. It also took years before the right job opened up, and there were a couple near moves into technical marketing that didn’t work out. I have to say, I’m glad I have this job and love (almost) every minute of it. Still, getting up in front of a bunch of your (rather smart) peer network engineers and claiming some sort of expertise is nerve-wracking. Wanting to do well in front of an audience can lead to frustration. My main breakout session, BRKCRS-2451, Scripting Catalyst Switches, won me two distinguished speaker awards in a row. This year, however, the scores are looking quite a bit lower. It didn’t help that the start time was 8am. I’m not a morning person, and 8am in Orlando was 5am for me. The old neurons just weren’t firing for the first 30-45 minutes of the presentation, and in front of 400 people that just isn’t good. A dose of humility is a good thing, though. I know TMEs who would kill for my “disappointing” score, so it wasn’t that bad. And the comments were quite helpful, in fact, and make clear what people are looking for and where they didn’t think I delivered. I structured BRKCRS-2451 as a journey through developing a script on IOS XE. The session begins with a demo of a fairly simple script, which pulls some data down from a switch and then formats it and sends it to a Webex Teams (formerly Spark) room. Then, I break down the script starting with installing Python, and some of the tools needed, like Git and Virtual Environments. Then I move on to YANG/NETCONF, talk about REST, and then wrap it up by showing how it all fits together to build the script I demoed. It was a winning formula for a while, but I’m suspecting network engineers have up-leveled their programmability skills in the last year or so. When I used to explain what GitHub was, network engineers usually were relieved to have it explained to them. Now I think they all know. I have a few ideas for making the session more relevant. Still, it was a great experience talking to 400 people, meeting customers around the show floor and halls, and visiting some of my colleagues’ sessions. 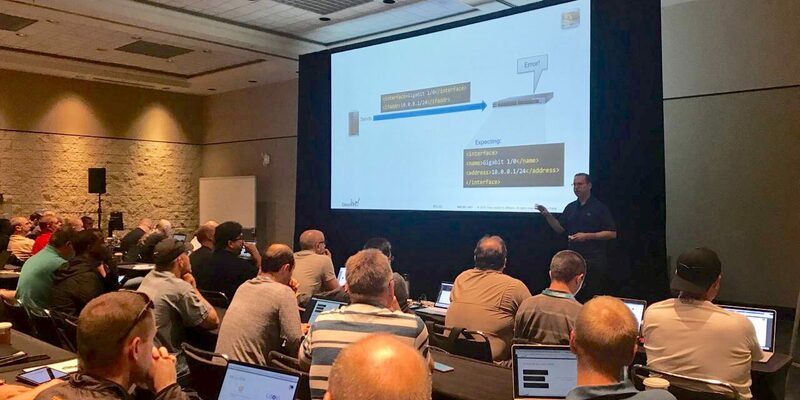 Hopefully my attendees got something out of the session, and I look forward to the next Cisco Live.